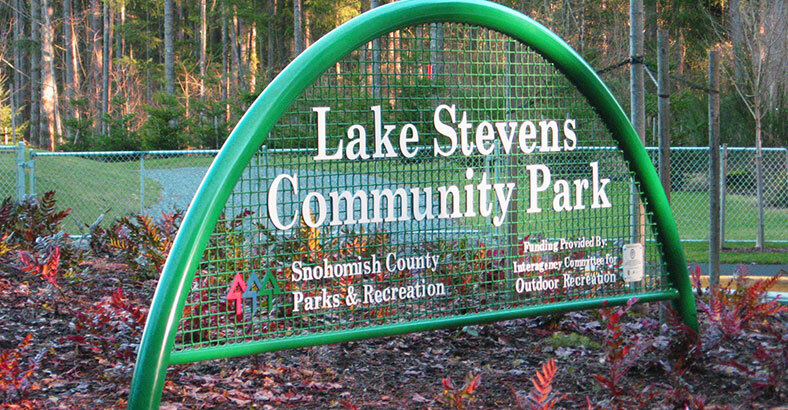 The Lake Stevens Community Park is an excellent example of what can be accomplished through cooperation of two public agencies and the desire of volunteer organizations to support funding and encourage elected officials to support the Parks & Recreation Department. The project demonstrates the character of the community through its emphasis on preserving the unique natural features and resources as well as the emphasis on providing active and passive recreation features for the entire community of all ages and interests. Primary program elements include three natural grass ballfields, four natural grass soccer/multi-use fields, a children’s play area, basketball half courts, picnicking, a loop trail, a restroom/concession building, and parking. 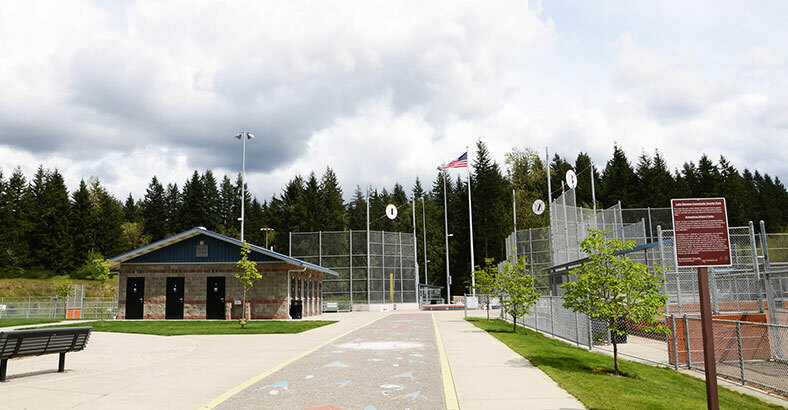 The ball field complex is configured with three back-to-back fields consisting of two youth baseball and one combination softball/baseball field. The center includes a restroom/concession building. Each of the fields has built-in seating capacity for 200 people and includes bullpen areas for home and visiting teams. All fields include covered dugouts, storage shelves and bat racks at each dugout. The center plaza is elevated 24” above the fields for excellent viewing for all spectators. The larger combination field has state-of-the-art floodlighting and base foundations for 60’, 65’, 70’ and 80’ bases. All three ball fields and all four soccer fields are underdrained to extend the season of play. ADA compliant porous asphalt paths circumscribe the soccer/multiuse fields, providing a maintenance edge for the fields and walking, jogging, and in-line skating for park visitors. The porous asphalt surface maximizes stormwater infiltration and prevents ponding on any of the paths. The play area is located adjacent to a picnic area and near the field, but at an adequate distance to ensure child safety. Picnic tables surround the play area and are near restrooms and the basketball courts. Parking is provided for 300 cars. The entire design revolves around a significant wetland, which was protected and made a focal point of sustainability. The east side of the site remains in native vegetation. There is a wide native vegetation buffer between the playfields and another large off-site wetland which contains a Great Blue Heron rookery. The clean water supply required to sustain the wetland was determined and maintained as part of the stormwater design. The four grass soccer/multi-use fields are underdrained to provide good drainage year round. Water percolating through the sand is filtered by the sand to prevent nutrient runoff. That clean water is then directed to the wetland at a metered rate to sustain the wetland at the optimum water level. In addition to the wetlands, the design compliments the unique topography, utilizing it in certain locations as informal viewing areas. The county retained artist Glen Anderson to work with the landscape architect to incorporate thematic sports art. The ballfield complex entry follows a 200’ long walkway paving scheme consisting of colorful tile and metal elements. The details of the paving patterns depict some key elements of outdoor team sports such as sole patterns from sports cleats and quotations rendered in tile graphics of balls floating on this large “field”. Additional quotes relating to team play and personal achievement are placed along the framing edge of the overall pattern. The overall design reflects the rigor of rule-bound sports, with the more whimsical elements giving the walkway the playful balance that one expects in sporting engagements. Toward the outer edge of the complex’s center and the base of the flag pole are geometric patterns depicting various outdoor team sports, rendered primarily in large tile images of baseballs, footballs, and soccer balls. The side edge of the platform has 6” x 12” color transfers of vintage sports cards printed onto porcelain tile. Stormwater from the parking lots is treated via bioswales before it reaches an infiltration pond. The pond shape and planting was designed as a landscape feature along the walking / jogging trail. All stormwater is infiltrated on-site. There is no runoff from the site. An ad hoc committee of stakeholders was a key aspect of the public involvement and design process. Residents adjacent to the park were concerned about security and loss of privacy. Therefore, the design incorporated many features to preserve those conditions. A thick buffer of vegetation was preserved around the perimeter to maintain the privacy of adjacent properties. Perimeter fencing was utilized at the north, east, and west sides of the park to provide a physical barrier. The loop trail stays well away from private property, reducing the chance of park visitors venturing off trail and onto adjacent properties. This is a very large site that required extensive earthwork to create flat areas for the fields. 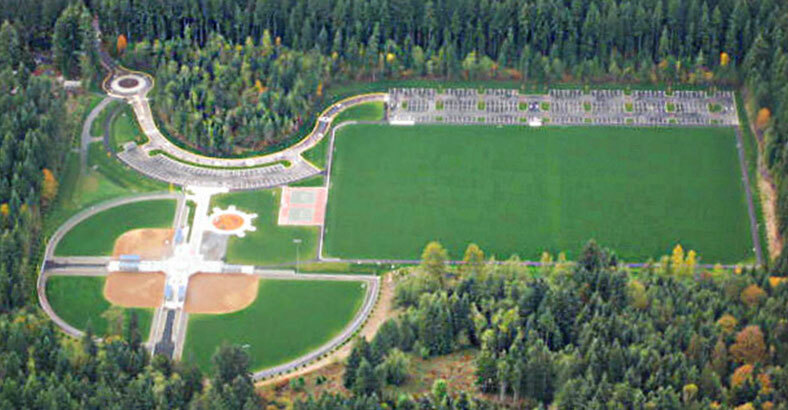 Earthwork was sequenced to allow the soccer fields to be adjusted up or down during construction to balance earthwork. This minimized the construction cost by avoiding costly import or export of materials. The irrigation system may be remotely controlled to turn off irrigation when the system is not needed on rainy days. The entire system is protected by master valves which automatically shut down the system in the event of a leak. Large trees are planted adjacent to and within the parking lots to reduce the heat island effect. Portions of the site consisted of impermeable hardpan, while other portions of the site were free draining. Field subdrainage lines in areas of the hardpan collect drainage and serve as conduits to the more permeable areas for infiltration. In the event the capacity of the infiltration is exceeded, water flows to an infiltration pond in the most permeable area of the site. From the outset, the mandate for on-site infiltration influenced the overall site design. Playing surfaces were underdrained and the perimeter of the fields utilized for infiltration trenches. The infiltration pond was located where free draining soils existed. Stormwater was allowed to infiltrate via the bioswales and pond. In addition, pervious asphalt pavement was utilized as surfacing for the perimeter trail. The county conducted an extensive plant salvage program prior to construction. Salvaged native plants were then used in other county parks. The top 6-12” of native soil and duff were removed prior to earthwork. That material was then screened for use as topsoil outside of the athletic fields and the tailings were utilized as non-structural fill. There was no off-site haul. Earthwork was balanced, avoiding expensive import or export. A large area for the collection of recycled materials was designed. Recyclable materials were utilized in construction where practical, including recycled plastic and the reuse of screened tailings mentioned above. Because of funding, the park had to be constructed in two phases. The phasing was planned so that the utilities were extended from the first phase to the second phase restroom/concession building and interface of paving was carefully established so the two phases could be blended without damaging or reworking edges of the previous phase. The entire site was designed to minimize maintenance. Therefore, most areas are accessible by gang mowers. Mow strips are provided in narrow areas. The finished product resulted in the creation of a local park that fulfilled the needs of the community by maximizing the usable space while preserving the topographic and vegetative character. Spectator areas were also designed to draw all interested park visitors to the various activities. Grading on the site was designed to attain flat surfaces for playing fields while preserving topographic and vegetative character. Accordingly, the ballfields were fit against the toe of the dominant “hill” on the south and the hillside was terraced to serve as an informal viewing area on the west. As a result, the character of the hill was retained. Earthwork was minimized, and walls avoided. Tailings from recycled screenings were used as non structural fill to create landscape berms and provide topographic relief outside the fields. Cost savings were also achieved by balancing earthwork while preserving and enhancing the site character and maximizing the programmable space. 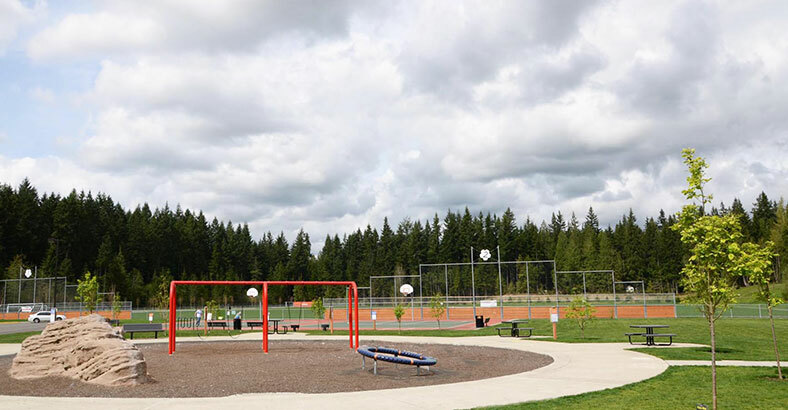 The finished project provided a high quality, cost effective athletic facility while at the same time preserving and protecting the surrounding Douglas Fir forest and sensitive ground water conditions in the area. ADA compliant paved paths connect all park facilities and circumscribe the four soccer fields. Trails were linked to the Centennial Trail which connects the park to many more miles of regional trails.